1 of 3 Place dough in a bowl coated with olive oil. Cover with a towel or plastic wrap and let stand at room temperature for at least 30 minutes. 2 of 3 Heat oven to 450 degrees . Transfer dough to a lightly floured surface and cut into 32 equal pieces. 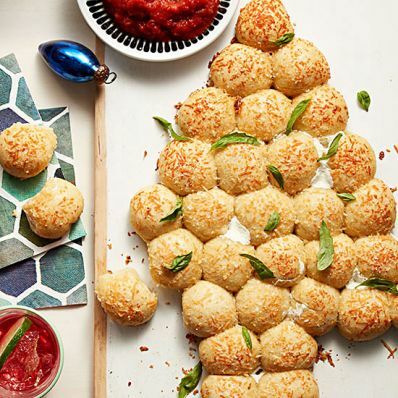 Form dough balls around mozzarella and arrange in a Christmas tree pattern (see Note) on a baking sheet lined with parchment paper. Brush dough with egg and pour melted butter over top. Combine Parmesan and garlic salt; sprinkle over dough. Bake 15 minutes, until golden brown. 3 of 3 Slide parchment onto a serving platter. Scatter basil on top and serve with marinara alongside.